This article is about the sunspot cycle. For the 28-year cycle of the Julian calendar, see Solar cycle (calendar). "The current prediction for Sunspot Cycle 24 gives a smoothed sunspot number maximum of about 69 in the late Summer of 2013. The smoothed sunspot number reached 68.9 in August 2013 so the official maximum will be at least this high. The smoothed sunspot number has been rising again towards this second peak over the last five months and has now surpassed the level of the first peak (66.9 in February 2012). Many cycles are double peaked but this is the first in which the second peak in sunspot number was larger than the first. We are currently over five years into Cycle 24. The current predicted and observed size makes this the smallest sunspot cycle since Cycle 14 which had a maximum of 64.2 in February of 1906." The solar cycle or solar magnetic activity cycle is the nearly periodic 11-year change in the Sun's activity (including changes in the levels of solar radiation and ejection of solar material) and appearance (changes in the number and size of sunspots, flares, and other manifestations). They have been observed (by changes in the Sun's appearance and by changes seen on Earth, such as auroras) for centuries. The changes on the Sun cause effects in space, in the atmosphere, and on Earth's surface. While it is the dominant variable in solar activity, aperiodic fluctuations also occur. Evolution of magnetism on the Sun. Solar cycles have an average duration of about 11 years. Solar maximum and solar minimum refer respectively to periods of maximum and minimum sunspot counts. Cycles span from one minimum to the next. 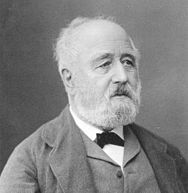 The solar cycle was discovered in 1843 by Samuel Heinrich Schwabe, who after 17 years of observations noticed a periodic variation in the average number of sunspots. Rudolf Wolf compiled and studied these and other observations, reconstructing the cycle back to 1745, eventually pushing these reconstructions to the earliest observations of sunspots by Galileo and contemporaries in the early seventeenth century. Following Wolf's numbering scheme, the 1755–1766 cycle is traditionally numbered "1". Wolf created a standard sunspot number index, the Wolf index, which continues to be used today. The period between 1645 and 1715, a time of few sunspots, is known as the Maunder minimum, after Edward Walter Maunder, who extensively researched this peculiar event, first noted by Gustav Spörer. In the second half of the nineteenth century Richard Carrington and Spörer independently noted the phenomena of sunspots appearing at different latitudes at different parts of the cycle. Reverses itself from one cycle to the next. Hale's observations revealed that the complete magnetic cycle spans two solar cycles, or 22 years, before returning to its original state. However, because nearly all manifestations are insensitive to polarity, the "11-year solar cycle" remains the focus of research. Furthermore, the two halves of the 22-year cycle are typically not identical; the 11-year cycles usually alternate between higher and lower sums of Wolf's sunspot numbers (the Gnevyshev-Ohl rule). In 1961 the father-and-son team of Harold and Horace Babcock established that the solar cycle is a spatiotemporal magnetic process unfolding over the Sun as a whole. They observed that the solar surface is magnetized outside of sunspots, that this (weaker) magnetic field is to first order a dipole, and that this dipole undergoes polarity reversals with the same period as the sunspot cycle. Horace's Babcock Model described the Sun's oscillatory magnetic field as having a quasi-steady periodicity of 22 years. It covered the oscillatory exchange of energy between toroidal and poloidal solar magnetic field ingredients. Reconstruction of solar activity over 11,400 years. Period of equally high activity over 8,000 years ago marked. Sunspot numbers over the past 11,400 years have been reconstructed using Carbon-14-based dendroclimatology. The level of solar activity beginning in the 1940s is exceptional – the last period of similar magnitude occurred around 9,000 years ago (during the warm Boreal period). The Sun was at a similarly high level of magnetic activity for only ~10% of the past 11,400 years. Almost all earlier high-activity periods were shorter than the present episode. Fossil records suggest that the Solar cycle has been stable for at least the last 700 million years. For example, the cycle length during the early Permian is estimated to be 10.62 years and similarly in the Neoproterozoic. Solar activity events recorded in radiocarbon. Present period is on right. Values since 1900 not shown. Until 2009 it was thought that 28 cycles had spanned the 309 years between 1699 and 2008, giving an average length of 11.04 years, but research then showed that the longest of these (1784–1799) seems actually to have been two cycles, so that the average length is only around 10.7 years. Since observations began cycles as short as 9 years and as long as 14 years have been observed, and in the double cycle of 1784–1799 one of the two component cycles had to be less than 8 years in length. Significant amplitude variations also occur. A list of historical "grand minima" of solar activity exists. There are many, often mutually contradictory predictions, based on different methods, for the forthcoming solar cycle 25, ranging from very weak to moderate magnitude. At present, no definite prediction can be made. The current solar cycle began on 4 January 2008, with minimal activity until early 2010. It is on track to have the lowest recorded sunspot activity since accurate records began in 1750. The cycle featured a "double-peaked" solar maximum. The first peak reached 99 in 2011 and the second in early 2014 at 101. It appears likely that Cycle 24 will end sometime between mid-2019 and late 2020. This cycle lasted 11.6 years, beginning in May 1996 and ending in January 2008. The maximum smoothed sunspot number (monthly number of sunspots averaged over a twelve-month period) observed during the solar cycle was 120.8 (March 2000), and the minimum was 1.7 . A total of 805 days had no sunspots during this cycle. Because the solar cycle reflects magnetic activity, various magnetically driven solar phenomena follow the solar cycle, including sunspots and coronal mass ejections. A drawing of a sunspot in the Chronicles of John of Worcester. The Sun's apparent surface, the photosphere, radiates more actively when there are more sunspots. Satellite monitoring of solar luminosity revealed a direct relationship between the Schwabe cycle and luminosity with a peak-to-peak amplitude of about 0.1%. Luminosity decreases by as much as 0.3% on a 10-day timescale when large groups of sunspots rotate across the Earth's view and increase by as much as 0.05% for up to 6 months due to faculae associated with large sunspot groups. The best information today comes from SOHO (a cooperative project of the European Space Agency and NASA), such as the MDI magnetogram, where the solar "surface" magnetic field can be seen. As each cycle begins, sunspots appear at mid-latitudes, and then move closer and closer to the equator until a solar minimum is reached. This pattern is best visualized in the form of the so-called butterfly diagram. Images of the Sun are divided into latitudinal strips, and the monthly-averaged fractional surface of sunspots is calculated. This is plotted vertically as a color-coded bar, and the process is repeated month after month to produce this time-series diagram. The sunspot butterfly diagram. This modern version is constructed (and regularly updated) by the solar group at NASA Marshall Space Flight Center. While magnetic field changes are concentrated at sunspots, the entire sun undergoes analogous changes, albeit of smaller magnitude. Time vs. solar latitude diagram of the radial component of the solar magnetic field, averaged over successive solar rotation. The "butterfly" signature of sunspots is clearly visible at low latitudes. Diagram constructed (and regularly updated) by the solar group at NASA Marshall Space Flight Center. The solar magnetic field structures the corona, giving it its characteristic shape visible at times of solar eclipses. Complex coronal magnetic field structures evolve in response to fluid motions at the solar surface, and emergence of magnetic flux produced by dynamo action in the solar interior. For reasons not yet understood in detail, sometimes these structures lose stability, leading to coronal mass ejections into interplanetary space, or flares, caused by sudden localized release of magnetic energy driving emission of ultraviolet and X-ray radiation as well as energetic particles. These eruptive phenomena can have a significant impact on Earth's upper atmosphere and space environment, and are the primary drivers of what is now called space weather. The occurrence frequency of coronal mass ejections and flares is strongly modulated by the cycle. Flares of any given size are some 50 times more frequent at solar maximum than at minimum. Large coronal mass ejections occur on average a few times a day at solar maximum, down to one every few days at solar minimum. The size of these events themselves does not depend sensitively on the phase of the solar cycle. A case in point are the three large X-class flares that occurred in December 2006, very near solar minimum; an X9.0 flare on Dec 5 stands as one of the brightest on record. An overview of three solar cycles shows the relationship between the sunspot cycle, galactic cosmic rays, and the state of our near-space environment. The Waldmeier effect names the observation that cycles with larger maximum amplitudes tend to take less time to reach their maxima than cycles with smaller amplitudes; maximum amplitudes are negatively correlated to the lengths of earlier cycles, aiding prediction. Solar maxima and minima also exhibit fluctuations at time scales greater than solar cycles. Increasing and decreasing trends can continue for periods of a century or more. The Schwabe Cycle is thought to be an amplitude modulation of the 87 year (70–100 year) Gleissberg cycle, named after Wolfgang Gleißberg. The Gleisberg cycle implied that the next solar cycle have a maximum smoothed sunspot number of about 145±30 in 2010 (instead 2010 was just after the cycle's solar minimum) and that the following cycle have a maximum of about 70±30 in 2023. Associated centennial variations in magnetic fields in the Corona and Heliosphere have been detected using Carbon-14 and beryllium-10 cosmogenic isotopes stored in terrestrial reservoirs such as ice sheets and tree rings and by using historic observations of Geomagnetic storm activity, which bridge the time gap between the end of the usable cosmogenic isotope data and the start of modern satellite data. These variations have been successfully reproduced using models that employ magnetic flux continuity equations and observed sunspot numbers to quantify the emergence of magnetic flux from the top of the solar atmosphere and into the Heliosphere, showing that sunspot observations, geomagnetic activity and cosmogenic isotopes offer a convergent understanding of solar activity variations. 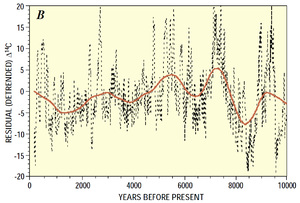 2,300 year Hallstatt solar variation cycles. The 210 year Suess cycle (a.k.a. "de Vries cycle", named after Hans Eduard Suess and Hessel De Vries respectively) is recorded from radiocarbon studies, although "little evidence of the Suess Cycle" appears in the 400-year sunspot record. The Hallstatt cycle (named after a cool and wet period in Europe when glaciers advanced) is hypothesized to extend for approximately 2,400 years. An as yet unnamed cycle may extend over 6,000 years. In carbon-14 cycles of 105, 131, 232, 385, 504, 805 and 2,241 years have been observed, possibly matching cycles derived from other sources. Damon and Sonett proposed carbon 14-based medium- and short-term variations of periods 208 and 88 years; as well as suggesting a 2300-year radiocarbon period that modulates the 208-year period. The Sun's magnetic field structures its atmosphere and outer layers all the way through the corona and into the solar wind. Its spatiotemporal variations lead to various measurable solar phenomena. Other solar phenomena are closely related to the cycle, which serves as the energy source and dynamical engine for the former. Activity cycles 21, 22 and 23 seen in sunspot number index, TSI, 10.7cm radio flux, and flare index. The vertical scales for each quantity have been adjusted to permit overplotting on the same vertical axis as TSI. Temporal variations of all quantities are tightly locked in phase, but the degree of correlation in amplitudes is variable to some degree. Sunspots eventually decay, releasing magnetic flux in the photosphere. This flux is dispersed and churned by turbulent convection and solar large-scale flows. These transport mechanisms lead to the accumulation of magnetized decay products at high solar latitudes, eventually reversing the polarity of the polar fields (notice how the blue and yellow fields reverse in the Hathaway/NASA/MSFC graph above). The dipolar component of the solar magnetic field reverses polarity around the time of solar maximum and reaches peak strength at the solar minimum. CMEs (coronal mass ejections) produce a radiation flux of high-energy protons, sometimes known as solar cosmic rays. These can cause radiation damage to electronics and solar cells in satellites. Solar proton events also can cause single-event upset (SEU) events on electronics; at the same, the reduced flux of galactic cosmic radiation during solar maximum decreases the high-energy component of particle flux. CME radiation is dangerous to astronauts on a space mission who are outside the shielding produced by the Earth's magnetic field. Future mission designs (e.g., for a Mars Mission) therefore incorporate a radiation-shielded "storm shelter" for astronauts to retreat to during such an event. Gleißberg developed a CME forecasting method that relies on consecutive cycles. On the positive side, the increased irradiance during solar maximum expands the envelope of the Earth's atmosphere, causing low-orbiting space debris to re-enter more quickly. The outward expansion of solar ejecta into interplanetary space provides overdensities of plasma that are efficient at scattering high-energy cosmic rays entering the solar system from elsewhere in the galaxy. The frequency of solar eruptive events is modulated by the cycle, changing the degree of cosmic ray scattering in the outer solar system accordingly. As a consequence, the cosmic ray flux in the inner solar system is anticorrelated with the overall level of solar activity. This anticorrelation is clearly detected in cosmic ray flux measurements at the Earth's surface. Some high-energy cosmic rays entering Earth's atmosphere collide hard enough with molecular atmospheric constituents to cause occasionally nuclear spallation reactions. Fission products include radionuclides such as 14C and 10Be that settle on the Earth's surface. Their concentration can be measured in ice cores, allowing a reconstruction of solar activity levels into the distant past. Such reconstructions indicate that the overall level of solar activity since the middle of the twentieth century stands amongst the highest of the past 10,000 years, and that epochs of suppressed activity, of varying durations have occurred repeatedly over that time span. The total solar irradiance (TSI) is the amount of solar radiative energy incident on the Earth's upper atmosphere. TSI variations were undetectable until satellite observations began in late 1978. A series of radiometers were launched on satellites from the 1970s to the 2000s. TSI measurements varied from 1360 to 1370 W/m2 across ten satellites. One of the satellites, the ACRIMSAT was launched by the ACRIM group. The controversial 1989–1991 "ACRIM gap" between non-overlapping ACRIM satellites was interpolated by the ACRIM group into a composite showing +0.037%/decade rise. Another series based on the ACRIM data is produced by the PMOD group and shows a −0.008%/decade downward trend. This 0.045%/decade difference impacts climate models. Solar irradiance varies systematically over the cycle, both in total irradiance and in its relative components (UV vs visible and other frequencies). The solar luminosity is an estimated 0.07 percent brighter during the mid-cycle solar maximum than the terminal solar minimum. Photospheric magnetism appears to be the primary cause (96%) of 1996–2013 TSI variation. The ratio of ultraviolet to visible light varies. TSI varies in phase with the solar magnetic activity cycle with an amplitude of about 0.1% around an average value of about 1361.5 W/m2 (the "solar constant"). Variations about the average of up to −0.3% are caused by large sunspot groups and of +0.05% by large faculae and the bright network on a 7-10-day timescale (see TSI variation graphics). Satellite-era TSI variations show small but detectable trends. TSI is higher at solar maximum, even though sunspots are darker (cooler) than the average photosphere. This is caused by magnetized structures other than sunspots during solar maxima, such as faculae and active elements of the "bright" network, that are brighter (hotter) than the average photosphere. They collectively overcompensate for the irradiance deficit associated with the cooler, but less numerous sunspots. The primary driver of TSI changes on solar rotational and sunspot cycle timescales is the varying photospheric coverage of these radiatively active solar magnetic structures. Energy changes in UV irradiance involved in production and loss of ozone have atmospheric effects. The 30 HPa Atmospheric pressure level changed height in phase with solar activity during solar cycles 20–23. UV irradiance increase caused higher ozone production, leading to stratospheric heating and to poleward displacements in the stratospheric and tropospheric wind systems. 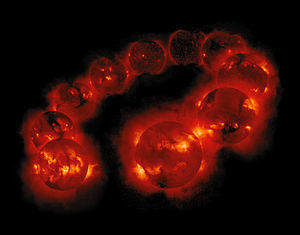 A solar cycle: a montage of ten years' worth of Yohkoh SXT images, demonstrating the variation in solar activity during a sunspot cycle, from after August 30, 1991, to September 6, 2001. Credit: the Yohkoh mission of ISAS (Japan) and NASA (US). With a temperature of 5870 K, the photosphere emits a proportion of radiation in the extreme ultraviolet (EUV) and above. However, hotter upper layers of the Sun's atmosphere (chromosphere and corona) emit more short-wavelength radiation. Since the upper atmosphere is not homogeneous and contains significant magnetic structure, the solar ultraviolet (UV), EUV and X-ray flux varies markedly over the cycle. 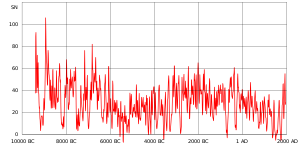 The photo montage to the left illustrates this variation for soft X-ray, as observed by the Japanese satellite Yohkoh from after August 30, 1991, at the peak of cycle 22, to September 6, 2001, at the peak of cycle 23. Similar cycle-related variations are observed in the flux of solar UV or EUV radiation, as observed, for example, by the SOHO or TRACE satellites. Even though it only accounts for a minuscule fraction of total solar radiation, the impact of solar UV, EUV and X-ray radiation on the Earth's upper atmosphere is profound. Solar UV flux is a major driver of stratospheric chemistry, and increases in ionizing radiation significantly affect ionosphere-influenced temperature and electrical conductivity. Emission from the Sun at centimetric (radio) wavelength is due primarily to coronal plasma trapped in the magnetic fields overlying active regions. The F10.7 index is a measure of the solar radio flux per unit frequency at a wavelength of 10.7 cm, near the peak of the observed solar radio emission. F10.7 is often expressed in SFU or solar flux units (1 SFU = 10−22 W m−2 Hz−1). It represents a measure of diffuse, nonradiative coronal plasma heating. It is an excellent indicator of overall solar activity levels and correlates well with solar UV emissions. Sunspot activity has a major effect on long distance radio communications, particularly on the shortwave bands although medium wave and low VHF frequencies are also affected. High levels of sunspot activity lead to improved signal propagation on higher frequency bands, although they also increase the levels of solar noise and ionospheric disturbances. These effects are caused by impact of the increased level of solar radiation on the ionosphere. 10.7 cm solar flux could interfere with point-to-point terrestrial communications. Changes in ionization affect the aerosol abundance that serves as the condensation nucleus for cloud formation. During solar minima more cosmic rays reach Earth, potentially creating ultra-small aerosol particles as precursors to Cloud condensation nuclei. Clouds formed from greater amounts of condensation nuclei are brighter, longer lived and likely to produce less precipitation. A change in cosmic rays could cause an increase in certain types of clouds, affecting Earth's albedo. It was proposed that, particularly at high latitudes, cosmic ray variation may impact terrestrial low altitude cloud cover (unlike a lack of correlation with high altitude clouds), partially influenced by the solar-driven interplanetary magnetic field (as well as passage through the galactic arms over longer timeframes), but this hypothesis was not confirmed. Later papers showed that production of clouds via cosmic rays could not be explained by nucleation particles. Accelerator results failed to produce sufficient, and sufficiently large, particles to result in cloud formation; this includes observations after a major solar storm. Observations after Chernobyl do not show any induced clouds. The impact of the solar cycle on living organisms has been investigated (see chronobiology). Some researchers claim to have found connections with human health. The amount of ultraviolet UVB light at 300 nm reaching the Earth varies by as much as 400% over the solar cycle due to variations in the protective ozone layer. In the stratosphere, ozone is continuously regenerated by the splitting of O2 molecules by ultraviolet light. During a solar minimum, the decrease in ultraviolet light received from the Sun leads to a decrease in the concentration of ozone, allowing increased UVB to reach the Earth's surface. Skywave modes of radio communication operate by bending (refracting) radio waves (electromagnetic radiation) through the Ionosphere. During the "peaks" of the solar cycle, the ionosphere becomes increasingly ionized by solar photons and cosmic rays. This affects the propagation of the radio wave in complex ways that can either facilitate or hinder communications. Forecasting of skywave modes is of considerable interest to commercial marine and aircraft communications, amateur radio operators and shortwave broadcasters. These users occupy frequencies within the High Frequency or 'HF' radio spectrum that are most affected by these solar and ionospheric variances. Changes in solar output affect the maximum usable frequency, a limit on the highest frequency usable for communications. Both long-term and short-term variations in solar activity are proposed to potentially affect global climate, but it has proven challenging to show any link between solar variation and climate. Early research attempted to correlate weather with limited success, followed by attempts to correlate solar activity with global temperature. The cycle also impacts regional climate. Measurements from the SORCE's Spectral Irradiance Monitor show that solar UV variability produces, for example, colder winters in the U.S. and northern Europe and warmer winters in Canada and southern Europe during solar minima. Total solar irradiance ("Radiative forcing"). Ultraviolet irradiance. The UV component varies by more than the total, so if UV were for some (as yet unknown) reason having a disproportionate effect, this might affect climate. Solar wind-mediated galactic cosmic ray changes, which may affect cloud cover. The sunspot cycle variation of 0.1% has small but detectable effects on the Earth's climate. Camp and Tung suggest that solar irradiance correlates with a variation of 0.18 K ±0.08 K (0.32 °F ±0.14 °F) in measured average global temperature between solar maximum and minimum. Other effects include one study which found a relationship with wheat prices, and another one that found a weak correlation with the flow of water in the Paraná River. Eleven-year cycles have been found in tree-ring thicknesses and layers at the bottom of a lake hundreds of millions of years ago. The current scientific consensus, most specifically that of the IPCC, is that solar variations only play a marginal role in driving global climate change, since the measured magnitude of recent solar variation is much smaller than the forcing due to greenhouse gases. Also, solar activity in the 2010s was not higher than in the 1950s (see above), whereas global warming had risen markedly. Otherwise, the level of understanding of solar impacts on weather is low. Solar cycle also affects the orbital decay of Low Earth Orbiting (LEO) objects by affecting the density at the upper thermospheric levels. The 11-year sunspot cycle is half of a 22-year Babcock–Leighton solar dynamo cycle, which corresponds to an oscillatory exchange of energy between toroidal and poloidal solar magnetic fields. At solar-cycle maximum, the external poloidal dipolar magnetic field is near its dynamo-cycle minimum strength, but an internal toroidal quadrupolar field, generated through differential rotation within the tachocline, is near its maximum strength. At this point in the dynamo cycle, buoyant upwelling within the Convection zone forces emergence of the toroidal magnetic field through the photosphere, giving rise to pairs of sunspots, roughly aligned east–west with opposite magnetic polarities. The magnetic polarity of sunspot pairs alternates every solar cycle, a phenomenon known as the Hale cycle. During the solar cycle's declining phase, energy shifts from the internal toroidal magnetic field to the external poloidal field, and sunspots diminish in number. At solar minimum, the toroidal field is, correspondingly, at minimum strength, sunspots are relatively rare and the poloidal field is at maximum strength. During the next cycle, differential rotation converts magnetic energy back from the poloidal to the toroidal field, with a polarity that is opposite to the previous cycle. The process carries on continuously, and in an idealized, simplified scenario, each 11-year sunspot cycle corresponds to a change in the polarity of the Sun's large-scale magnetic field. Although the tachocline has long been thought to be the key to generating the Sun's large-scale magnetic field, recent research has questioned this assumption. Radio observations of brown dwarfs have indicated that they also maintain large-scale magnetic fields and may display cycles of magnetic activity. The Sun has a radiative core surrounded by a convective envelope, and at the boundary of these two is the tachocline. However, brown dwarfs lack radiative cores and tachoclines. Their structure consists of a solar-like convective envelope that exists from core to surface. Since they lack a tachocline yet still display solar-like magnetic activity, it has been suggested that solar magnetic activity is only generated in the convective envelope. ^ "NASA/Marshall Solar Physics". nasa.gov. Retrieved 2015-11-17. This article incorporates text from this source, which is in the public domain. ^ Eddy, John A. (June 1976). "The Maunder Minimum". Science. 192 (4245): 1189–1202. Bibcode:1976Sci...192.1189E. doi:10.1126/science.192.4245.1189. JSTOR 1742583. PMID 17771739. (Subscription required (help)). ^ "Sunspot Number graphics". oma.be. ^ a b Usoskin, Ilya G.; Solanki, Sami K.; Kovaltsov, Gennady A. (2007). "Grand minima and maxima of solar activity: New observational constraints" (PDF). Astron. Astrophys. 471 (1): 301–309. arXiv:0706.0385. Bibcode:2007A&A...471..301U. doi:10.1051/0004-6361:20077704. ^ a b Solanki, Sami K.; Usoskin, Ilya G.; Kromer, Bernd; Schüssler, Manfred; Beer, Jürg (2004). "Unusual activity of the Sun during recent decades compared to the previous 11,000 years" (PDF). Nature. 431 (7012): 1084–1087. Bibcode:2004Natur.431.1084S. doi:10.1038/nature02995. PMID 15510145. Retrieved 17 April 2007. , "11,000 Year Sunspot Number Reconstruction". Global Change Master Directory. Retrieved 2005-03-11. ^ Usoskin, Ilya G.; Solanki, Sami K.; Schüssler, Manfred; Mursula, Kalevi; Alanko, Katja (2003). "A Millennium Scale Sunspot Number Reconstruction: Evidence For an Unusually Active Sun Since the 1940's". Physical Review Letters. 91 (21): 211101. arXiv:astro-ph/0310823. Bibcode:2003PhRvL..91u1101U. doi:10.1103/PhysRevLett.91.211101. PMID 14683287. ^ a b Luthardt, Ludwig; Rößler, Ronny (February 2017). "Fossil forest reveals sunspot activity in the early Permian". Geology. 45 (2): 279. Bibcode:2017Geo....45..279L. doi:10.1130/G38669.1. ^ a b Li, Pengbo; et al. (Sep 2018). "Sunspot cycles recorded in siliciclastic biolaminites at the dawn of the Neoproterozoic Sturtian glaciation in South China". Precambrian Research. 315: 75–91. doi:10.1016/j.precamres.2018.07.018. ^ Michael Marshall (Aug 18, 2018). "Rock layers show our sun has been in same cycle for 700 million years". New Scientist. ^ Usoskin, I. G.; Mursula, K.; Arlt, R.; Kovaltsov, G. A. (2009). "A solar cycle lost in 1793–1800: Early sunspot observations resolve the old mystery". The Astrophysical Journal. 700 (2): L154. arXiv:0907.0063. Bibcode:2009ApJ...700L.154U. doi:10.1088/0004-637X/700/2/L154. ^ "Centuries-old sketches solve sunspot mystery". New Scientist. 1 Aug 2009. p. 10. ^ for example: "ADS search for "solar prediction"". Retrieved 1 January 2018. ^ esa. "SOHO: the new solar cycle starts with a 'bang'". European Space Agency. Retrieved 11 May 2017. ^ Tony Phillips (10 January 2008). "Solar Cycle 24 begins". NASA. Retrieved 29 May 2010. ^ Tony Phillips (4 June 2010). "As the Sun Awakens, NASA Keeps a Wary Eye on Space Weather". NASA. Retrieved 18 May 2013. ^ "Solar Cycle Progression". www.swpc.noaa.gov. NOAA / NWS Space Weather Prediction Center. Retrieved 6 July 2015. ^ "Scientists predict a new solar cycle is about to begin and that it might be stronger than the last one". sidc.be. ^ "SIDC Monthly Smoothed Sunspot Number". ^ "What's wrong with the Sun? (Nothing) more information: Spotless Days". Archived from the original on 14 July 2008. ^ "Solaemon's Spotless Days Page". ^ Willson, Richard C.; H.S. Hudson (1991). "The Sun's luminosity over a complete solar cycle". Nature. 351 (6321): 42–4. Bibcode:1991Natur.351...42W. doi:10.1038/351042a0. ^ Willson RC, Gulkis S, Janssen M, Hudson HS, Chapman GA (February 1981). "Observations of Solar Irradiance Variability". Science. 211 (4483): 700–2. Bibcode:1981Sci...211..700W. doi:10.1126/science.211.4483.700. PMID 17776650. ^ "The Most Powerful Solar Flares Ever Recorded". Spaceweather.com. ^ "Extreme Space Weather Events". National Geophysical Data Center. Retrieved 2015-11-17. ^ Du, Zhan-Le; Wang, Hua-Ning; He, Xiang-Tao (2006). "The Relation between the Amplitude and the Period of Solar Cycles". J. Astron. Astrophys. 6 (4): 489–494. Bibcode:2006ChJAA...6..489D. doi:10.1088/1009-9271/6/4/12. ^ Sonett, C. P.; Finney, S. A.; Berger, A. (24 April 1990). "The Spectrum of Radiocarbon". Philosophical Transactions of the Royal Society A. 330 (1615): 413–26. Bibcode:1990RSPTA.330..413S. doi:10.1098/rsta.1990.0022. ^ a b Braun, H; Christl, M; Rahmstorf, S; Ganopolski, A; Mangini, A; Kubatzki, C; Roth, K; Kromer, B (10 November 2005). "Possible solar origin of the 1,470-year glacial climate cycle demonstrated in a coupled model" (PDF). Nature. 438 (7065): 208–11. Bibcode:2005Natur.438..208B. doi:10.1038/nature04121. PMID 16281042. ^ Hathaway, David H.; Wilson, Robert M. (2004). "What the Sunspot Record Tells Us About Space Climate" (PDF). Solar Physics. 224 (1–2): 5–19. Bibcode:2004SoPh..224....5H. doi:10.1007/s11207-005-3996-8. Archived from the original (PDF) on 4 January 2006. Retrieved 19 April 2007. ^ Owens M.J. & Forsyth R.J. (2013). "The Heliospheric Magnetic Field". Living Reviews in Solar Physics. 10 (5): 5. arXiv:1002.2934. Bibcode:2013LRSP...10....5O. doi:10.12942/lrsp-2013-5. ^ "The Sun and Climate" (PDF). U.S. Geological Survey. Fact Sheet 0095-00. Retrieved 2015-11-17. ^ Vasiliev, S. S.; Dergachev, V. A. (2002). "The ~ 2400-year cycle in atmospheric radiocarbon concentration: bispectrum of 14C data over the last 8000 years". ANGEO. 20 (1): 115–20. Bibcode:2002AnGeo..20..115V. doi:10.5194/angeo-20-115-2002. ^ Usoskin; et al. (2016). "Solar activity during the Holocene: the Hallstatt cycle and its consequence for grand minima and maxima". Astron. Astrophys. 587: A150. arXiv:1602.02483. Bibcode:2016A&A...587A.150U. doi:10.1051/0004-6361/201527295. ^ Scafetta, Nicola; Milani, Franco; Bianchini, Antonio; Ortolani, Sergio (2016). "On the astronomical origin of the Hallstatt oscillation found in radiocarbon and climate records throughout the Holocene". Earth-Science Reviews. 162: 24–43. arXiv:1610.03096. doi:10.1016/j.earscirev.2016.09.004. ^ Xapsos, M. A.; Burke, E. A. (July 2009). "Evidence of 6 000-Year Periodicity in Reconstructed Sunspot Numbers". Solar Physics. 257 (2): 363–9. Bibcode:2009SoPh..257..363X. doi:10.1007/s11207-009-9380-3. ^ Damon, Paul E.; Jirikowic, John L. (2006-03-31). "The Sun as a low-frequency harmonic oscillator". Radiocarbon. 34 (2): 199–205. doi:10.2458/azu_js_rc.34.1450. ISSN 0033-8222. ^ see table in "Solar Variability: climatic change resulting from changes in the amount of solar energy reaching the upper atmosphere". Introduction to Quaternary Ecology. Archived from the original on 2005-03-20. Retrieved 2015-07-16. ^ Anderson, Roger Y. (1982-08-20). "A long geoclimatic record from the Permian". Journal of Geophysical Research. 87 (C9): 7285–7294. Bibcode:1982JGR....87.7285A. doi:10.1029/JC087iC09p07285. ^ Wolfgang Gleißberg (1953). Die Häufigkeit der Sonnenflecken (in German). Berlin: Ahademie Verlag. ^ Potgeiter, M. (2013). "Solar Modulation of Cosmic Rays". Living Reviews in Solar Physics. 10 (1): 3. arXiv:1306.4421. Bibcode:2013LRSP...10....3P. doi:10.12942/lrsp-2013-3. ^ Solanki, Sami K.; Usoskin, Ilya G.; Kromer, Bernd; Schüssler, Manfred; Beer, Jürg (2004). "Unusual activity of the Sun during recent decades compared to the previous 11,000 years" (PDF). Nature. 431 (7012): 1084–7. Bibcode:2004Natur.431.1084S. doi:10.1038/nature02995. PMID 15510145. ^ Richard C. Willson (2014-05-16). "ACRIM3 and the Total Solar Irradiance database". Astrophysics and Space Science. 352 (2): 341–352. Bibcode:2014Ap&SS.352..341W. doi:10.1007/s10509-014-1961-4. ^ Willson, R.C. ; et al. (1981). "Observations of Solar Irradiance Variability". Science. 211 (4483): 700–2. Bibcode:1981Sci...211..700W. doi:10.1126/science.211.4483.700. PMID 17776650. ^ K.L. Yeo; et al. (2014-09-23). "Reconstruction of total and spectral solar irradiance from 1974 to 2013 based on KPVT, SoHO/MDI and SDO/HMI observations". Astronomy & Astrophysics. 570: A85. arXiv:1408.1229. Bibcode:2014A&A...570A..85Y. doi:10.1051/0004-6361/201423628. ^ Haigh, J. D; Winning, A. R; Toumi, R; Harder, J. W (October 6, 2010). "An influence of solar spectral variations on radiative forcing of climate". Nature. 467 (7316): 696–9. Bibcode:2010Natur.467..696H. doi:10.1038/nature09426. hdl:10044/1/18858. PMID 20930841. ^ Willson RC; Hudson HS (1991). "The Sun's luminosity over a complete solar cycle". Nature. 351 (6321): 42–4. Bibcode:1991Natur.351...42W. doi:10.1038/351042a0. ^ Willson R.C. ; Gulkis S.; Janssen M.; Hudson H.S. ; Chapman G.A. (1981). "Observations of solar irradiance variability". Science. 211 (4483): 700–2. Bibcode:1981Sci...211..700W. doi:10.1126/science.211.4483.700. PMID 17776650. ^ "Total Solar Irradiance Graph from ACRIM page". ACRIM project web page. Retrieved 2015-11-17. ^ Willson R.C. ; Mordvinov A.V. (2003). "Secular total solar irradiance trend during solar cycles 21–23". Geophys. Res. Lett. 30 (5): 1199. Bibcode:2003GeoRL..30.1199W. doi:10.1029/2002GL016038. ^ Scafetta N.; Willson R.C. (2009). "ACRIM-gap and TSI trend issue resolved using a surface magnetic flux TSI proxy model". Geophys. Res. Lett. 36 (5): L05701. Bibcode:2009GeoRL..36.5701S. doi:10.1029/2008GL036307. ^ Haigh, J D (May 17, 1996). "The Impact of Solar Variability on Climate". Science. 272 (5264): 981–984. Bibcode:1996Sci...272..981H. doi:10.1126/science.272.5264.981. ^ Tapping K.F. (1987). "Recent solar radio astronomy at centimeter wavelength: the temporal variability of the 10.7-cm flux". J. Geophys. Res. 92 (D1): 829–838. Bibcode:1987JGR....92..829T. doi:10.1029/JD092iD01p00829. ^ "The Effect of 10.7 cm Solar Radiation on 2.4 GHz Digital Spread Spectrum Communications". NARTE News. 17 (3). July–October 1999. ^ Tinsley, Brian A.; Yu, Fangqun (2004). "Atmospheric Ionization and Clouds as Links Between Solar Activity and Climate" (PDF). In Pap, Judit M.; Fox, Peter. Solar Variability and its Effects on Climate. Geophysical monograph series. 141. American Geophysical Union. pp. 321–339. Bibcode:2004GMS...141..321T. CiteSeerX 10.1.1.175.5237. doi:10.1029/141GM22. ISBN 978-0-87590-406-1. [dead link] "Department of Physics – the University of Texas at Dallas". Archived from the original on 2015-08-15. Retrieved 2015-08-10. ^ "CERN's CLOUD experiment provides unprecedented insight into cloud formation" (Press release). CERN. 25 August 2011. Retrieved 12 November 2016. ^ Shaviv, Nir J (2005). "On climate response to changes in the cosmic ray flux and radiative budget" (PDF). Journal of Geophysical Research. 110 (A08105): A08105. arXiv:physics/0409123. Bibcode:2005JGRA..110.8105S. doi:10.1029/2004JA010866. Retrieved 17 June 2011. ^ Svensmark, Henrik (2007). "Cosmoclimatology: a new theory emerges". Astronomy & Geophysics. 48 (1): 1.18–1.24. Bibcode:2007A&G....48a..18S. doi:10.1111/j.1468-4004.2007.48118.x. ^ Svensmark, Henrik (1998). "Influence of Cosmic Rays on Earth's Climate" (PDF). Physical Review Letters. 81 (22): 5027–5030. Bibcode:1998PhRvL..81.5027S. CiteSeerX 10.1.1.522.585. doi:10.1103/PhysRevLett.81.5027. Retrieved 17 June 2011. ^ Shaviv, Nir J & Veizer, Ján (2003). "Celestial driver of Phanerozoic climate?". Geological Society of America. 13 (7): 4. doi:10.1130/1052-5173(2003)013<0004:CDOPC>2.0.CO;2. ^ Sun, B.; Bradley, R. (2002). "Solar influences on cosmic rays and cloud formation: A reassessment". Journal of Geophysical Research. 107 (D14): 4211. Bibcode:2002JGRD..107.4211S. doi:10.1029/2001jd000560. ^ Pierce, J.; Adams, P. (2009). "Can cosmic rays affect cloud condensation nuclei by altering new particle formation rates?". Geophysical Research Letters. 36 (9): 36. Bibcode:2009GeoRL..36.9820P. doi:10.1029/2009gl037946. ^ Snow-Kropla, E.; et al. (Apr 2011). "Cosmic rays, aerosol formation and cloud-condensation nuclei: sensitivities to model uncertainties". Atmospheric Chemistry and Physics. 11 (8): 4001. Bibcode:2011ACP....11.4001S. doi:10.5194/acp-11-4001-2011. ^ Erlykin, A.; et al. (Aug 2013). "A review of the relevance of the 'CLOUD' results and other recent observations to the possible effect of cosmic rays on the terrestrial climate". Meteorology and Atmospheric Physics. 121 (3): 137. arXiv:1308.5067. Bibcode:2013MAP...121..137E. doi:10.1007/s00703-013-0260-x. ^ Sloan, T.; Wolfendale, A. (Jun 2007). "Cosmic Rays and Global Warming". 30TH INTERNATIONAL COSMIC RAY CONFERENCE, Merida, Mexico. ^ Halberg, F; Cornélissen, G; Otsuka, K; Watanabe, Y; Katinas, GS; Burioka, N; Delyukov, A; Gorgo, Y; Zhao, Z (2000). "Cross-spectrally coherent ~10.5- and 21-year biological and physical cycles, magnetic storms and myocardial infarctions". Neuroendocrinology Letters. 21 (3): 233–258. PMID 11455355. Archived from the original on 2008-07-29. ^ Weart, Spencer (2003). "Changing Sun, Changing Climate?". The Discovery of Global Warming. Harvard University Press. ISBN 978-0-674-01157-1. Retrieved 17 April 2008. ^ Ineson S.; Scaife A.A.; Knight J.R.; Manners J.C.; Dunstone N.J.; Gray L.J. ; Haigh J.D. (October 9, 2011). "Solar forcing of winter climate variability in the Northern Hemisphere". Nature Geoscience. 4 (11): 753–7. Bibcode:2011NatGe...4..753I. doi:10.1038/ngeo1282. hdl:10044/1/18859. ^ Labitzke K.; Matthes K. (2003). "Eleven-year solar cycle variations in the atmosphere: observations, mechanisms and models". The Holocene. 13 (3): 311–7. Bibcode:2003Holoc..13..311L. doi:10.1191/0959683603hl623rp. ^ Pablo J.D. Mauas & Andrea P. Buccino. "Long-term solar activity influences on South American rivers" page 5. Journal of Atmospheric and Solar-Ter restrial Physics on Space Climate, March 2010. Accessed: 20 September 2014. ^ Zanchettin, D.; Rubino, A.; Traverso, P.; Tomasino, M. (2008). "[Impact of variations in solar activity on hydrological decadal patterns in northern Italy]". Journal of Geophysical Research. 113 (D12): D12102. Bibcode:2008JGRD..11312102Z. doi:10.1029/2007JD009157. ^ C. D. Camp & K. K. Tung (2007). "Surface warming by the solar cycle as revealed by the composite mean difference projection". Geophysical Research Letters. 34 (14): L14703. Bibcode:2007GeoRL..3414703C. doi:10.1029/2007GL030207. ^ "Sunspot activity may be linked to rainfall", New Scientist, 8 Nov., 2008, p. 10. ^ Molaverdikhani, Karan; Ajabshirizadeh, A. (2016). "Complexity of the Earth's space–atmosphere interaction region (SAIR) response to the solar flux at 10.7 cm as seen through the evaluation of five solar cycle two-line element (TLE) records". Advances in Space Research. 58 (6): 924–937. Bibcode:2016AdSpR..58..924M. doi:10.1016/j.asr.2016.05.035. ^ Hale, G. E.; Ellerman, F.; Nicholson, S. B.; Joy, A. H. (1919). "The Magnetic Polarity of Sun-Spots". The Astrophysical Journal. 49: 153. Bibcode:1919ApJ....49..153H. doi:10.1086/142452. ^ "NASA Satellites Capture Start of New Solar Cycle". PhysOrg. 4 January 2008. Retrieved 10 July 2009. ^ Phillips, T. (15 February 2001). "The Sun Does a Flip". NASA. Archived from the original on 4 November 2001. Retrieved 11 July 2009. ^ Route, Matthew (October 20, 2016). "The Discovery of Solar-like Activity Cycles Beyond the End of the Main Sequence?". The Astrophysical Journal Letters. 830 (2): 27. arXiv:1609.07761. Bibcode:2016ApJ...830L..27R. doi:10.3847/2041-8205/830/2/L27. Willson, Richard C.; H.S. Hudson (1991). "The Sun's luminosity over a complete solar cycle". Nature. 351 (6321): 42–4. Bibcode:1991Natur.351...42W. doi:10.1038/351042a0. Foukal, Peter; et al. (1977). "The effects of sunspots and faculae on the solar constant". Astrophysical Journal. 215: 952. Bibcode:1977ApJ...215..952F. doi:10.1086/155431. 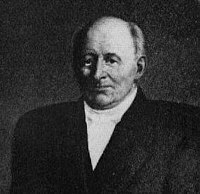 Dziembowski, W.A. ; P.R. Goode; J. Schou (2001). "Does the sun shrink with increasing magnetic activity?". Astrophysical Journal. 553 (2): 897–904. arXiv:astro-ph/0101473. Bibcode:2001ApJ...553..897D. doi:10.1086/320976. Stetson, H.T. (1937). Sunspots and Their Effects. New York: McGraw Hill. Yaskell, Steven Haywood (31 December 2012). Grand Phases On The Sun: The case for a mechanism responsible for extended solar minima and maxima. Trafford Publishing. ISBN 978-1-4669-6300-9. Wikimedia Commons has media related to Solar cycles. NOAA / NESDIS / NGDC (2002) Solar Variability Affecting Earth NOAA CD-ROM NGDC-05/01. This CD-ROM contains over 100 solar-terrestrial and related global data bases covering the period through April 1990. Solanki, S.K. ; Fligge, M. (2001). "Long-term changes in solar irradiance". In Wilson, A. Proceedings of the 1st Solar and Space Weather Euroconference, 25–29 September 2000, Santa Cruz de Tenerife, Tenerife, Spain. The Solar Cycle and Terrestrial Climate. 463. ESA Publications Division. pp. 51–60. Bibcode:2000ESASP.463...51S. ISBN 978-9290926931. ESA SP-463. Solanki, S.K. ; Fligge, M. (2000). "Reconstruction of past solar irradiance". Space Science Reviews. 94 (1/2): 127–38. doi:10.1023/A:1026754803423. Solar Cycle Update: Twin Peaks?. 2013. This page was last edited on 12 April 2019, at 23:46 (UTC).